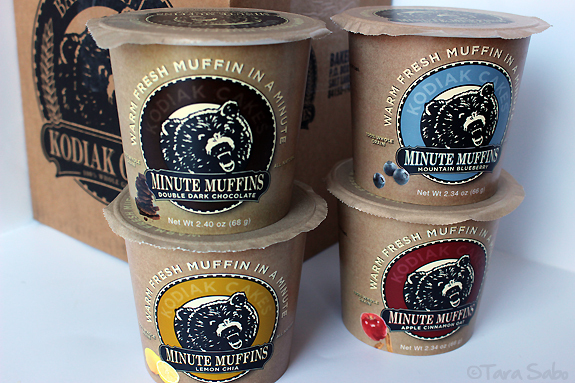 A Daily Dose of Fit: @KodiakCakes #MinuteMuffins: Quick and delicious breakfast in 60 seconds. 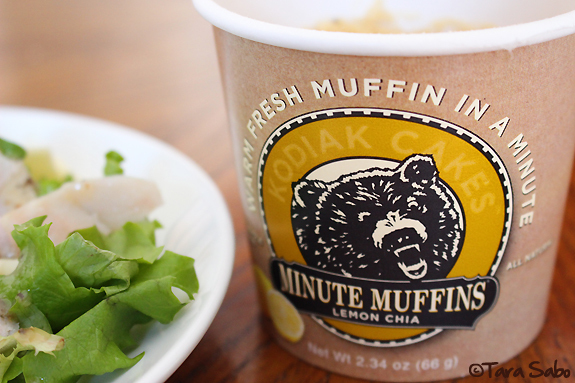 @KodiakCakes #MinuteMuffins: Quick and delicious breakfast in 60 seconds. A few weeks ago, I contacted Kodiak Cakes to see if they'd be interested in sending over a few samples of their newest breakfast items—muffins that cook in one minute, hence the name. Minute Muffins. I'm a regular user of their pancake and waffle mixes and, having seen a few photos of the aforementioned deliciousness online, figured these newbies were a must-try. I've eaten all but the Mountain Blueberry muffin and, lemme tell ya, they're so good. Even the Apple Cinnamon, a typical flavor, was deliciously different. Each muffin is packed with fiber, protein and whole grains. And all you need is a bit of water and a microwave. 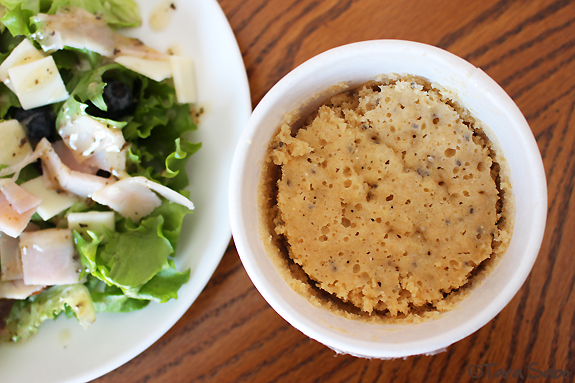 In 60 seconds, you'll get a muffin in a cup. Which, if you've ever tried to eat a muffin on the go, is a good thing. And these muffins were certainly made to eat on the go. Or, you know, at home when you need a healthy breakfast rather quickly...which is pretty typical for me as I'm always running out the door to teach a class or snag a workout. I don't always have time to make breakfast from scratch, so I like to keep some instant (but healthy) options on hand. Confession: I had a Minute Muffin for lunch today, though. Because, you know, breakfast isn't just for breakfast. And I was super hungry, so I took the quick route. Minute Muffins for the win. Lemon Chia for the super win. Holy taste buds, best flavor ever. Minute Muffins cook up to a light and fluffy, super moist muffin. Exactly like a muffin is supposed to be, really. Filling on its own, sure, but I wanted a little something more for my lunch so I added the side salad. Complete with my favorite lemon-based salad dressing. And a glass of lemonade. If you want to try Minute Muffins for yourself, keep an eye out for them wherever Kodak Cakes products are currently sold. I'm almost certain they can be found in select WalMarts, and you can order them from Amazon if you wish. Otherwise, keep up with Kodiak Cakes on Facebook, Twitter and Instagram for more. And, before I end this post, a friendly reminder: Eat breakfast! It's really important to start your day off right. Figure out what works for you, but fuel your body from the get-go to experience the most you can from your day. And to set yourself up for a day of healthy, balanced eating. Skip breakfast and you'll set yourself up for overindulging at lunch, right? Question: Are you a breakfast person? What is your favorite thing to eat? I won some of these through a twitter giveaway with Kodiak Cakes and LOVE them for a quick meal on the go that differs from oatmeal. The flavors are super tasty!